“This Branch Is My Branch” was the key to taking this photo. I noticed this juvenile male Vermilion Flycatcher from a distance. Since this is a special bird, I really wanted a photo. As I moved closer, the bird flew to another tree. I followed the bird. And each time I moved, it flew away. This went on, back and forth, for about ten minutes – with no photo. So I stopped to study what the bird was doing. From this, I noticed that the bird was moving randomly about in the trees with one exception. It always returned to one branch. By the way, this is typical flycatcher behavior. They will dart off to catch a bug, and then return to a favorite perch. I set my camera to focus on the branch with the light behind me. Then I waited. Soon the bird returned. Then it flew off. Then it returned. Then it flew off. Each time it returned I had a few seconds to take photos. After about 20 minutes I had taken the above photo, with an attractive head angle. Sometimes the result we want can be gained by letting it come to us. So we pause, study what’s happening, and then wait. So we can help these birds by leaving bugs alone. This photo was taken at the Casa de San Pedro B&B. This is an outstanding place to stay in Southeastern Arizona – featuring gourmet breakfasts, wonderful staff, and beautiful birds. You are to be commended on your patience. That is a wonderful spot. I once had a picture of a mature male Vermilion on the San Pedro Riparian Conservation Area sign. Casa de San Pedro is a wonderful B & B.
I really like your help birds tip. Beautiful, and another great lesson. Stop chasing what you want, breathe, enjoy the moment – and perhaps what you desire will come to you. Lovely. And isn’t he a pretty bird?! Congratulations, great shot (and advice)!!! 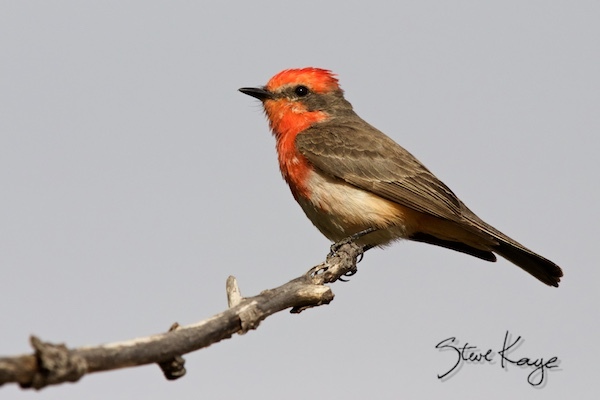 Last year I had a few chances to observe a Vermillion Flycatcher snagging his food in the air from his favorite perch. He is a terrific bug killing machine and fantastic flyer. Congratulations on snagging this great photo. Lovely picture and wonderful story and tips. As always, thanks for sharing!